When searching for the best grill pan, you want one that will distribute heat evenly and provide the best value. We selected Cuisinart CI30-23CR Chef’s Classic Enameled Cast Iron 9-1/4-Inch Square Grill Pan. This grill pan has an enamel lining that does not impact the food’s flavor. It does not absorb any of the food odors. It is constructed of cast iron which allows the pan to distribute heat evening and also retain heat. The Cuisinart has wide handles to give you a secure and comfortable grip. It can be used on the stove top or in the oven. It is dishwasher safe. When you are looking for the best grill pan, you want a pan that will cook your food completely without much effort on your part. You want a pan that is not too heavy for you to lift and carry. When looking for a grill pan, size matters. You want a grill pan that can meet your cooking needs and hold the proper amount of food for you and your family. Be sure the interior is big enough to cook more than one steak at a time. The materials are key. You want a grill pan that will distribute heat evenly like a cast iron. When looking for a grill pan, you want one that will give your food the same flavor as if you cooked in on a grill. This is important because you want a grill pan that holds the food you want. You want a grill pan with ribs and channels to pull the fat away from the food during cooking. You also want a grill pan that has a rounded bottom, so you can stir your food more easily. Be sure the grill pan you pick has handles that stay cool to the touch. You want a handle that you can hold comfortably in your hand. Preferably, you want a grill pan with a long handle on one side and a smaller helper handle on the opposite side. This will help you carry your grill pan. You want a grill pan that is not too heavy to hold. Remember, food adds weight. If the grill pan is too heavy for you without food in it, it is going to be unmanageable with food. Price is important, but should not be the driving factor. Make sure the pan is in your price range, but also gives you the quality you desire. Remember, the most expensive product may not always be the best one. Look at all the features a grill pan offers you before you rule it out. 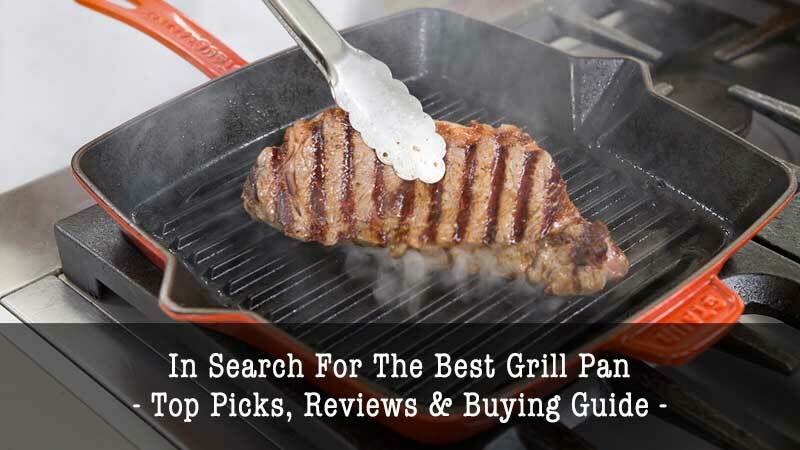 To find the best grill pans, we studied the reviews and ratings from consumers and professionals. From the countless models we researched, these ten are the ones we feel offer the best value, reputation and cooking ability. What you will love about the Cuisinart CI30-23CR Chef’s Classic Enameled Cast Iron 9-1/4-Inch Square Grill Pan: It does not absorb odors and distributes heat evenly. The Cuisinart CI30-23CR Chef’s Classic Cast Iron Pan has an interior that is lined with enamel so it will not change the flavor of the food, or absorb any of the food odors. The construction of cast iron gives the grill pan the ability to distribute heat evenly and provide exceptional heat retention. It has wide handles that allow you to have a secure and comfortable grip on the pan. The Chef’s Classic Square Grill Pan has an oven safe knob allowing you to have a lasting grip. You can cook, serve and entertain directly from the Cuisinart grill pan. This Cusinart is perfect if you want to start cooking steak on a grill pan. It can be used on the stove, or in the oven, or even under a broiler. The grill pan only weighs a little more than five pounds. Its dimensions are 15.9 inches by 10.2 inches by 3.4 inches. Cuisinart is known to be a timeless and durable cookware manufacturer. The Cuisinart is easy to clean as it is dishwasher safe. You can find the best grill pan on the market, the Cuisinart CI30-23CR, at Amazon for about $38 to $43. Many colors from which to choose. You should use only wooden utensils that are gentle on the enamel. What you will love about the Lodge 10.5 Inch Square Cast Iron Grill Pan: It has ribs on the grill that raises the food and collects food drippings. The Lodge Square Cast Iron is the best grill pan because it is unmatched in its ability to retain heat and the grill pan heats evenly. Lodge uses its 120 years of experience to create durable, versatile and high-quality products. This Lodge 10.5 inch grill pan is made in the US in South Pittsburgh, Tennessee. The Lodge company was built on strong values and solid American history to create the highest quality cookware. They family run company uses cast iron and carbon steel to manufacture their products. 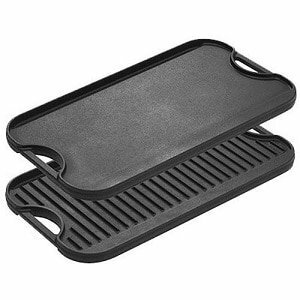 This square grill pan is per seasoned for to allow for perfect grilling and easy draining. You can use it to bake, fry, boil, and sear foods. Lodge does not use anything synthetic to season its grill pan. Instead, they use 100 percent vegetable oil. Food releases easily from the grill pan due to the seasoning. The more you use your grill pan, the better seasoned it will get. The Lodge Square Grill Pan should be cleaned by hand washing with mild soap. You can wash it without soap, also. You must dry it right away and completely with a cloth that is lint free. Rub on a thin layer of vegetable oil while the grill pan is still warm. It should be stored in a dry place. You can find The Lodge grill pan ranging in price from $19 to $45, depending on where you purchase it. It can be used on any heat source. The more the grill pan is used, the better seasoned it gets. You must continue to season it with oil. What you will love about the Lodge 10.5 Inch Square Cast Iron Grill Pan: It is reversible. You are getting two grill pans in one. The Lodge LPGI3 Pro Grid and Griddle Reversible Pan have a griddle pan with ribs on one side and it is flat on the other side. This grill pan fits across two burners on the stove top. It has two handles that are easy to grip and can be used to lift, or hang the pan when not being used. The flat side can be used for foods like eggs or pancakes. The ribbed side can be used for grilled food like steak and chicken. The Lodge reversible grill pan comes already seasoned. Lodge does not use any chemicals or synthetics in its coatings. It is seasoned with 100 percent vegetable oil. The more the grill pan is used, the better the seasoning gets. All Lodge products are manufactured in South Pittsburgh, Tennessee. This family run company was built and still operates on it solid American history and values and is proud to create the highest quality cookware. All products are made from carbon steel and cast iron. To clean your Lodge grill pan, you should hand wash your cast iron pan with mild soap, or no soap at all. Dry your grill pan immediately with a lint free towel. Season the pan after cleaning with a thin layer of vegetable oil. Store the pan in a dry place. Double-sided cooking surface for different types of foods. Big enough to fit across two burners. You have to continue to season the grill pan with oil. What you will love about the Calphalon 1948254 Signature Hard Anodized Nonstick Grill Pan: It has Signature Sear Nonstick interior to cook food evenly. 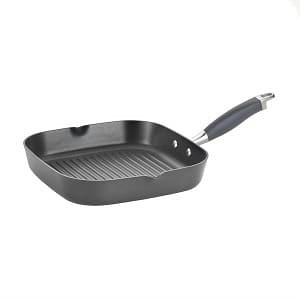 The Calphalon 1948254 Signature Hard Anodized Nonstick Grill Pan falls into the best grill pan category because it is manufactured a hard anodized, heavy gauge aluminum for extra durability. Calphalon is a best-rated grill pan because of its blending of performance, nonstick convenience, and durability. 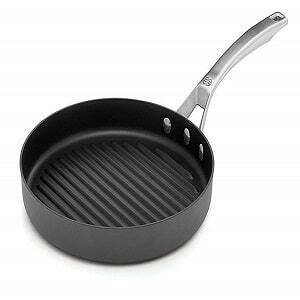 This 12 inch round griddle pan has an interior that has Calphalon’s signature sear nonstick surface. It is free of the chemical Perfluorooctanoic Acid (PFOA), which is found in Teflon. The inside of the grill pan has ribs to provide grill lines and flavor to your food while draining off excess fat during cooking. This makes it so easy to grill hamburgers and hot dogs from inside your house. It also handles chicken and vegetable like a pro. The hard anodized surface distributes heat more evenly making this the perfect way to prepare paninis and grilled cheese. The handle is made of brushed stainless steel and remains cool when you are cooking on top of the stove. You can use any type of utensil you want on the griddle, even metal won’t scratch the surface. This griddle is dishwasher safe, which makes it effortless to clean. Calphalon provides a full lifetime warranty for any products that have defects in workmanship or parts. Calphalon will replace the grill if it is cared for and used properly. You can use any type of utensil on the grill pan. Brushed stainless steel handle stays cool on the stove top. A bit more expensive than your average grill pan. What you will love about the Anolon Advanced Hard Anodized Nonstick 11 Inch Deep Square Grill Pan: It has spouts on either side of the pan to easily drain fat. 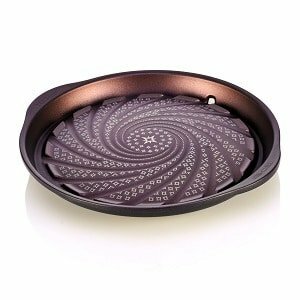 The Anolon Advanced Hard Anodized Grill Pan is 11 inches deep with pour spouts. 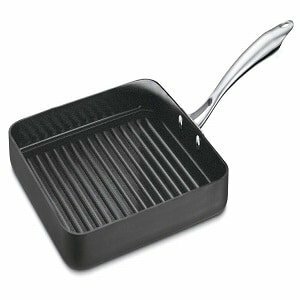 This square grill pan is heavy duty and its construction is hard anodized. It allows for the heat to distribute evenly for incredible cooking performance. It has ridges along the interior to give your food grill marks. 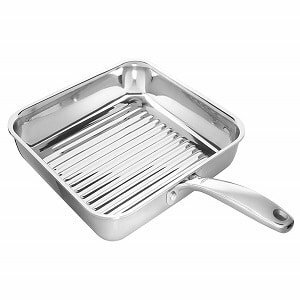 The grill pan has a channel around the sides that collects and holds fats, or any other liquids. This channel keeps the liquid away from the food and the spouts on the side make dumping out the fat an easy task. This deep square grill pan does not contain the chemical Perfluorooctanoic Acid (PFOA). It uses DuPont Autograph 2 on the internal surface to ensure it remains nonstick. You can use metal utensils as the surface of this grill pan to can up to professional use. Thanks to the nonstick surface, clean up is a breeze. The handle is made of a rubber stainless steel Anolon grip to give you confidence when lifting it. The handle is safe for the oven up to 400 degrees F.
This grill pan is light, weighing in at only 2.5 pounds. The dimensions are 11 inches wide by 11 inches deep by 3.75 inches high. Anolon offers a limited lifetime warranty on their products. Pour spouts to remove fat. Any type of utensils can be used on the pan. It cannot be used on an induction stovetop. What you will love about the TeChef Stovetop Korean BBQ Non-Stick Grill Pan: It is an innovative cooking system with a unique draining system. The TeChef Korean BBQ Grill Pan uses innovative technology to provide you with a healthy and effective way to cook. It boasts a unique swirl channel design and dome-shaped bottom that keeps fat and grease away from the food. This allows your cooking to be lower in fat but does not take away from the flavor of the food. This grill pan is excellent for pork belly, or any kind of meat. The grill pan has a hole in it which is where the grease comes out from the channel. You will need to put a glass container underneath the hole to catch the grease. This grill pan does not come with a drip cup. The TeChef is has five layers of Teflon select coating to provide the absolute best non-stick surface of any grill pan. It is made from a heavy gauge aluminum which makes it a durable piece of cookware that you will use for a long time. It does not contain the chemical Perfluorooctanoic Acid (PFOA), so it is safe. The TeChef Korean BBQ Grill Pan has a cool look and comes with its own cooking surface. Its cooking surface offers high power with 11,500 BTUs. It also has its own auto electric ignition. The innovative design allows grease to drain away from the food providing a healthier way to cook. The grill pan does create smoke. You will need a glass container to catch the fat that drips out. What you will love about the Cuisinart GG30-20 GreenGourmet Hard Anodized Nonstick 11 Inch Square Grill Pan: It uses 70 percent recycled materials and is its packaging is 100 percent recycled materials. The Cuisinart GG30-20 Green Gourmet is a 70 percent recycled grill pan. This square grill pan is 12 inches and made of hard anodized aluminum. The interior has a ceramic base that is nonstick and incredibly durable. You use much less energy when cooking with it because of how well it conducts heat. It safe to use in the broiler and the oven up to 400 degrees. It has a riveted handle that stays cool and won’t burn your hands while using it on the stove top. The Ceramics interior of the pan is exclusive to Cuisinart and does not contain the chemicals PTFE and PFOA. It does not contain petroleum. The packaging is made from materials that are 100 percent recycled and biodegradable soy ink is used for the printing. Cuisinart used a more refined manufacturing technique to craft their grill pan, which used less energy and released less carbon into the air. The grill pan has exceptional heat conduction, which gives you the same professional results while using less energy to cook your food. You should hand wash your pan with a mild soap. For over 35 years, Cuisinart has been using the best materials to make their professional cookware. They continue to be innovative and provide the quality you have come to expect with their Green Gourmet Hard Anodized grill pan. It is an environmentally conscious product. Incredibly durable and resistant against wear. It must be hand washed. What you will love about the OXO Good Grips Tri-Ply Stainless Steel Pro 11″ Square Grill Pan: It is completely stainless steel and has rolled edges for drop free pouring. 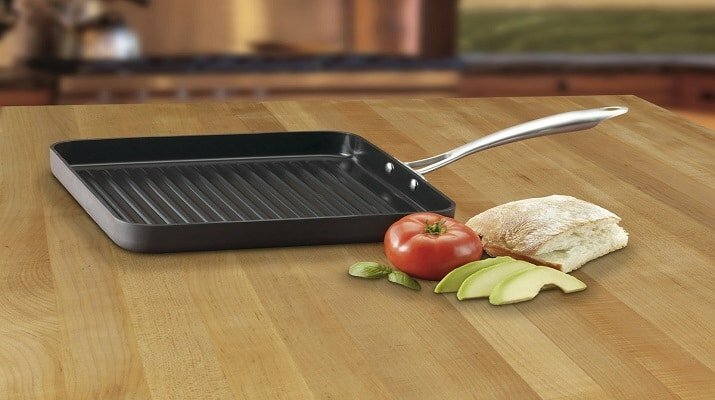 The OXO stainless steel grill pan features a unique design with rolled edges to allow you to pour from the pan without dripping any liquid. OXO has kept you in mind with the contoured handle that stays cool and can be gripped comfortably. This pan has a core made of heat radiant aluminum that is sandwiched between two 18/10 stainless steel layers. The stainless steel is magnetic which gives you the ability to cook evenly from all sides. You can easily and quickly cook meat, vegetables and more. The grill pan also has a unique interior design with its rounded bottom. This allows you to stir the contents easily. This grill pan is resisted scratches and it ultra durable. You can use it in the oven up to 430 degrees. It can be used on any stovetop, even induction stovetops. It is dishwasher safe. This grill pan weighs about 3.5 pounds. The dimensions are 19.3 inches by 11.9 inches by 3.1 inches. It can be used on induction stovetops. It is easy to clean in the dishwasher. A little heavier than many other pans. What you will love about the Le Creuset Cast Iron Signature Square Skillet Grill, 10 1/4″: It is excellent for slow cooking or searing at high temperatures. 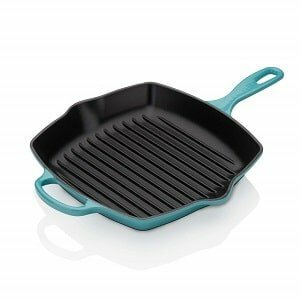 The Le Creuset Cast Iron Signature Square Skillet Grill sets itself apart from other cast iron grill pans because of its long history of durability and strength. Each pan is set in individual sand molds and inspected by hand by the best French artisans. Each one is crafted to represent the long history and rich tradition of Le Creuset. This grill pain is made of the finest enameled cast iron to allow for even heat distribution. The grill pan has ridges inside to allow fats and liquids to be pulled away from the food while cooking. This allows for lower fat cooking. The ridges also leave beautiful grill marks and the flavor of outdoor grilling on your food all from the comfort of your kitchen. Le Creuset crafts their pans with a black enamel finish that does not need seasoning. This protective finish protects the grill pan from every day use and prevents damage. The handle is made of cast iron and has a smaller handle on the opposite side to help you carry the pan. The pan has two spots on either side to allow for ease of pouring. The pan weighs over six pounds. The dimensions are 11.8 inches by 17 inches by 2 inches. It is dishwasher safe. The exterior enamel comes in brilliant colors that is resistant to cracking and chipping. 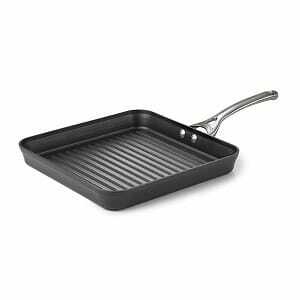 What you will love about the Calphalon Contemporary Hard-Anodized Aluminum Nonstick Cookware, Square Grill Pan: It has a large area to allow for extra servings. The Calphalon Contemporary Square Grill Pan is constructed from a heavy gauge aluminum giving it the ability to cook evenly. The hard anodized interior makes it incredibly durable. It has three layers of coating. The bottom two layers give the pan its durable qualities. The top layer allows the food to release easily from the grill pan. 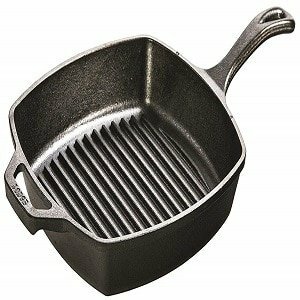 The pan is 11 inches and has interior ridges that are deep to give your food a grilled flavor. The handle is long and is made from brushed stainless steel. It allows for easy lifting and carrying. The handle stays cool to the touch when you’re cooking on the stovetop and the grill pan is safe for the oven, up to 450 degrees. Any type of utensil can be used on the nonstick surface. The grill pan weighs 2.75 pounds and the dimensions are 11 inches by 15 inches by 2 inches. The Calphalon grill pan is dishwasher safe, but it is recommended to hand wash the grill pan to extend the life. Calphalon offers a lifetime warranty on all of their products. Really should be hand washed, even though it claims to be dishwasher safe.